I notice beauty everywhere. I see it in the rusty nail, the broken fence. I see it in the crying face, the rounded hips. I see it when I am looking at your skin closely as you speak. I notice your freckles, your blemishes, your unkempt hair. I love those things. I also love a freshly made bed, water dripping from your eyelashes when you come from the shower, shadows and golden leaves. I am moved by the texture of wool socks and acorn tops, heat coming off of a wood stove, the way my arms twist above me when I dance, the slap on a table in frustration. My work is about the color, the vibrancy of these things, the hue that can be discovered within their essence. It’s about the human experience and of what happens when we really look, when we really listen, when we really see. Meghan Anderson Nathanson is an interdisciplinary artist and writer living and working in Freeport, ME. 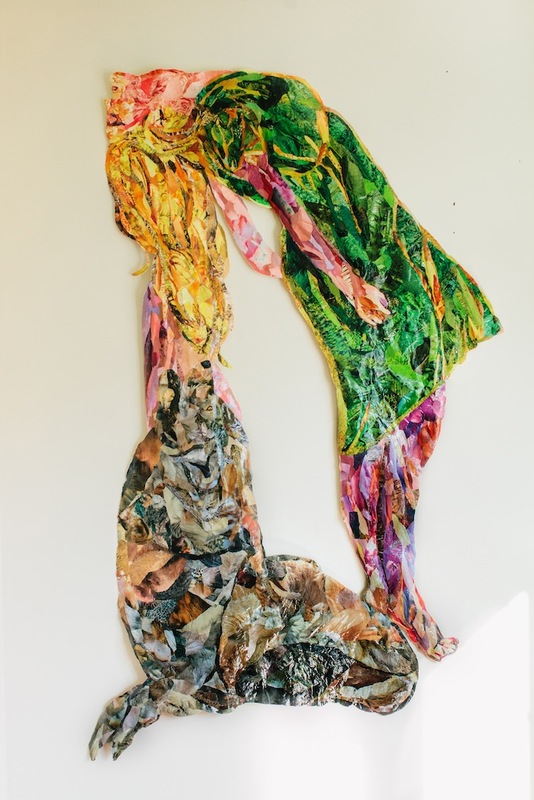 Her work flows holistically from who she is in a journal of emotional expressions exploring themes such as mindful presence, motherhood, inner and outer freedom, body language, sensuality, color, connection and the gifts of the earth as medium. Her journey as a visual artist began in the mid -1990’s in New York City where she received training in figure drawing through the Art Students League of New York as well as painting at The New School. Meghan’s work has been shown in the neighborhoods of DUMBO, the East Village and SOHO in New York City as well as in several coastal communities in Maine. 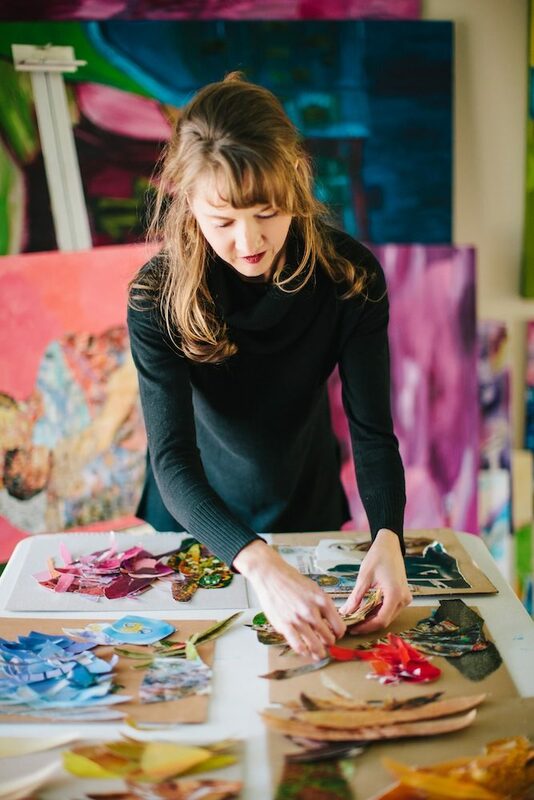 Meghan is currently working primarily in mixed media, transforming large figurative pencil drawings into colorful collages by applying the torn papers from repurposed wall-calendars onto the drawings in a painterly fashion. 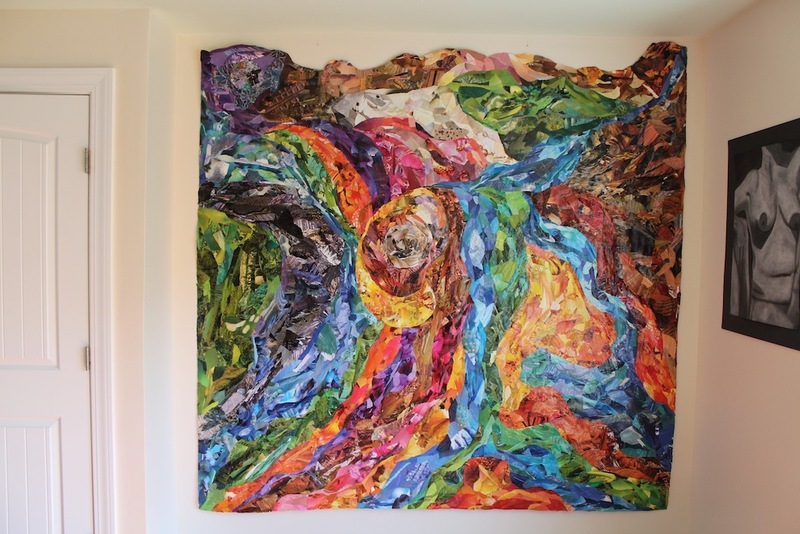 Some of her largest creations are composed of hundreds of individual pieces, each carefully selected, gently torn and massaged together with a polymer medium and combined into a cohesive whole. 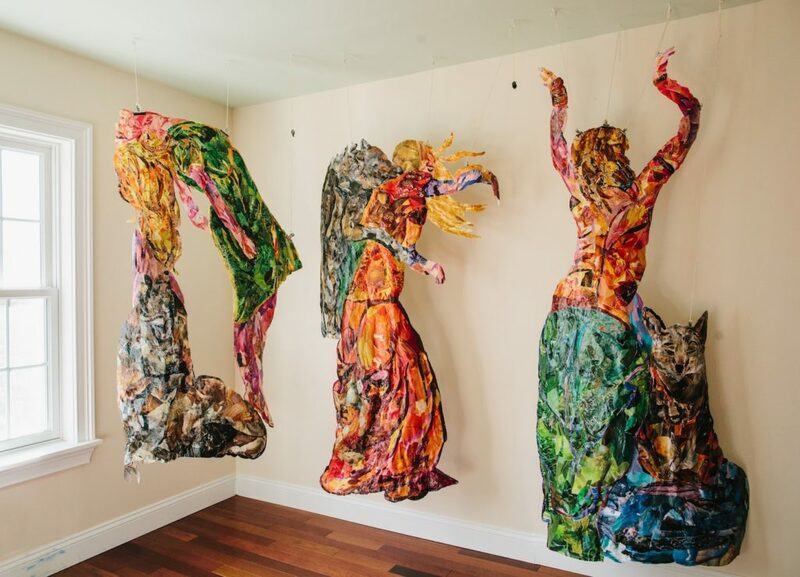 She is deeply open to listening in her craft and was recently surprised when a project with her children—gluing hundreds of acorns that had fallen on their back porch onto the outline of a tree—aroused inspiration and became a central piece in her body of work. Meghan is available for commissioned work and aspires to bring an understanding of her subjects into her creative process expressing who they are through a collection of colors and images specifically attributed to their essence.